We’ve heard this story all too much. You’re carrying something out to your car, and it just gets away from you. Before you realize it, your beloved car has a modest dent that you’ll never live down. Or maybe you’re in the parking lot and the shopping cart just happens to get away from you. There are countless reasons your car may receive a ding or a dent, and countless DIY paintless dent repair kits that you can buy in an attempt to repair the damage. While these options may be tempting to any car owner out there, we at the Collision Center of Andover recommend that you avoid this route. The good DIY kits can be about as expensive as having the expert technicians here perform the repair, and you want to completely avoid the cheaper one. Typically, the high-end DIY kits expect you to perform the repairs similar to how the pros like us would – from the inside. Most dents are best repaired by gently nudging the metal from behind. As you might imagine, this requires that you gain access those panels by first removing any trim in the way. From there, it takes an expert (and a surprisingly artistic) touch to make everything look as good as new. Ultimately, though, that’s the important part of dent repair. It’s less about tools and mechanical knowledge, and more about the touch. If you have a modest dent, it may seem like you can grab a shaping hammer and just give it a few light bumps to make it right as rain, but that’s rarely the case. Metal won’t just pop back into place that easily. It tends to hold its shape. Meaning, no matter how simple the dent might seem, in order to repair it, you’ll be reshaping the material to match what it originally looked like. This can sometimes be a painstaking process, and messing it up in any way can only make the dent more difficult to repair. 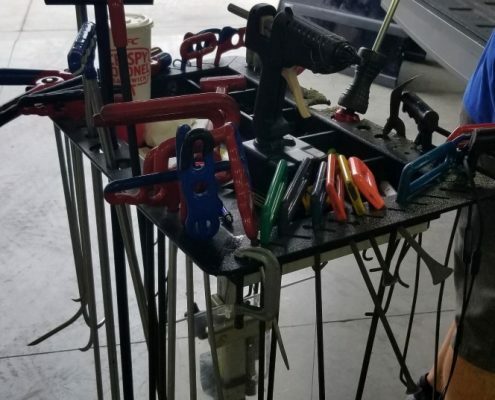 The end result may not only be the cost of a DIY repair kit, but also the increased cost of having the professionals here at the Collision Center of Andover repair it back to its original splendor. At this point, it may not only be a matter of fixing the repair, but also hiding an obvious embarrassment. If you’ve got a minor dent (or a few!) be sure to consider Collision Center of Andover’s paintless dent repair. It’s typically fast and relatively cheap. If you are interested in finding out more about our paintless dent repair service or any of the other services that we offer, contact us today and see just how we can help you! https://collisioncenterofandover.com/wp-content/uploads/2018/07/20180607_132711.jpg 664 1366 josh https://collisioncenterofandover.com/wp-content/uploads/2013/04/ccoa_logo_340x1561.png josh2018-07-19 04:26:242018-11-14 09:07:47Avoid DIY Paintless Dent Repair – Hire a Pro! ALS takes a special spot in the hearts of everyone here at Collision Center of Andover. The wife of our owner and manager, Ben Lawrence, suffers from the disease, so we leapt at the opportunity to support The ALS Association’s search for treatment and hopefully – eventually – a cure. Amyotrophic lateral sclerosis (ALS), or Lou Gehrig’s Disease as it’s better known, is a progressive neurodegenerative disease that affects brain and spinal cord nerve cells. Those afflicted will eventually lose the ability to initiate and control muscle movement. This often leads to total paralysis and death within two to five years of diagnosis, and for some reason, veterans are twice as likely to develop the disease. September each year, the Walk to Defeat ALS occurs along the Wichita waterfront, hoping to raise money to help overcome the disease. Last year alone, the citizens of Wichita helped to raise over $150,000 dollars. The goal this year is $215,000, and with any lucky, we’ll be able to band together to reach it. Anyone can volunteer for the walk, and there’s no fee for entry. Plus, the route is wheelchair accessible! And activities on Walk Day include something for people of any age! All you have to do is show up on September 22nd and support a great cause. If you do wish to walk­, however, be sure to register. So please consider getting a team together, or walking individually if you’re the lone wolf type. You can even join a preexisting team if your friends have already started one. Who knows, maybe you’ll be directly contributing to a cure for ALS. 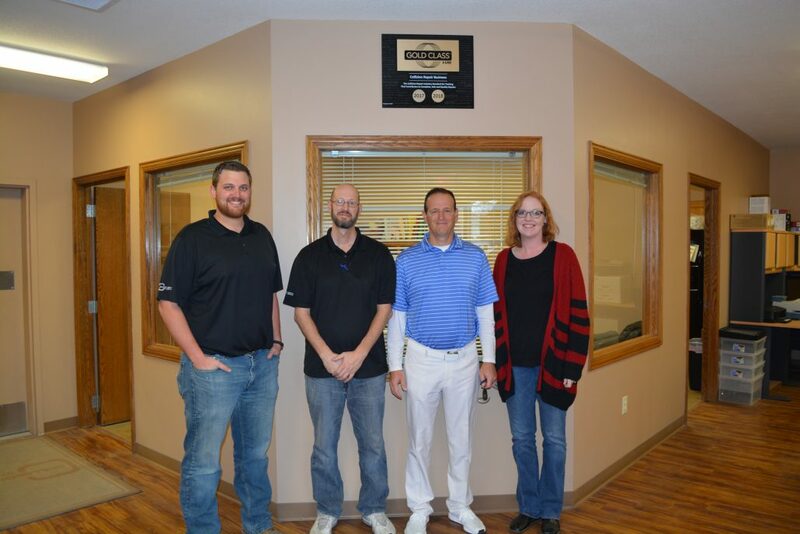 Way back on March 14th, 2006, Collision Center of Andover first began offering Wichita and Andover, and the surrounding area, high quality collision repair. It’s been a great decade or so, and we’re happy to have such an accomplished and skilled team, with technicians like Kyle, who’s been with us since 2008 and is quite possibly the best estimator in the area, and Kenny, who joined in 2007 and has been offering expert body repairs every day since. We’d like to send a special heartfelt thank you to all 12,000 of our customers (that’s right – we’ve had just over 12k customers in 12 years) for helping make Collision Center of Andover all that it is. Now that we’re Gold Certified, you can rest assured that no matter what kind of repairs are required, from a light repaint to a true reconstruction, Collision Center of Andover is here to ensure that you get your car back from us looking as good as new. Though we have no immediately plans to open any new locations – it’s difficult enough maintaining excellence at one location, let alone two – we do have plans to make our location here in Andover a bit more spacious. Expect to find the east part of the building opened up a bit, and we’ll be adding a brand-new paint shop so that we can service even more cars. If your vehicle is in desperate need of repair, Collision Center of Andover is here to help, just give us a call today at 316-733-9310, or contact us online. Whether you were in an accident, you were trying to teach your son or daughter how to parallel park, or you simply sat inside while hail ravaged your car, dents are a fact of life for almost all car owners. Dents and dings often don’t hinder the performance of your car (though they sometimes can), but they do ruin the aesthetic appeal of your car. Many people are afraid to get dents fixed because they are worried that it will cost them an arm and a leg to have the dent removed, the paint fixed, plus some may worry about the time and labor involved in repairing dents. However, paintless dent repair (PDR) means that you don’t have to go through all of that struggle and all of that cash! Paintless dent repair is designed to remove the dent, get your car back to its original shape, and look great – all without compromising the vehicle’s paint job. At Collision Center of Andover, we have vast experience in repairing cars while still keeping that factory paint in pristine condition. We have been trained thoroughly on the complicated art of paintless dent repair, and would love to help you with your car. Why get paintless dent repair? Paintless dent repair is the best way to maintain your vehicle’s value, even after having a problem. Dents and dings, at least according to Auto Trader, will decrease your vehicle’s resale value, especially if you have to get them patched with paint that isn’t the factory paint finish. Paintless dent repair also keeps the turnaround time to a minimum as we are able to get your car back to you in a few days, as opposed to a few weeks for conventional body work and paint. 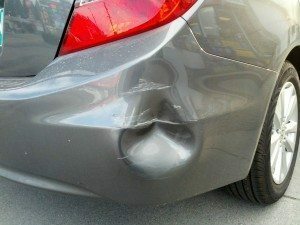 While you might be able to find a ton of online tutorials on how to fix a dent by yourself – techniques that include anything from machines that you can rent from your local hardware store to plungers that you can find in your own bathroom, we at Collision Center of Andover have a word of advice: DON’T DO IT. Those who specialize in paintless dent repair have gone through many hours of training and have practiced on countless cars so we know exactly what we are doing. Trying to remove the dent yourself could result in bigger problems, wasted time and worse, may hurt your paint to the point that we cannot save it. Still, if you want an overview on how we will approach your car, or what happens during our Paintless Dent Repair service, keep reading! Step 1: Free access to the dent. When we first start to remove your dent, we have to access the dent. The removal is done from the underside of the panel, so we have to have that free access to get to the dent itself. To free up that access, we have to remove any of the trims that are in our way. For example, if the dent is on the roof of the car, we will have to remove the hood sound pad so that we can access it. However, there is one place where we might not have to remove trims. If your dent is in your door, there is a method we can use where the window opening is utilized. We have to make sure that we have the proper lights that will allow us to see every single level of the dent. This includes setting up dent lights, but we also have to open all of the doors so that we can get light throughout the car. Failure to do this will mean that while the dent looks great from one level, as soon as you take a few steps to the left or right, you can still see the dent. We have a variety of paintless dent repair tools at our shop to help fix your dent – tools that you won’t be able to rent at a local store. 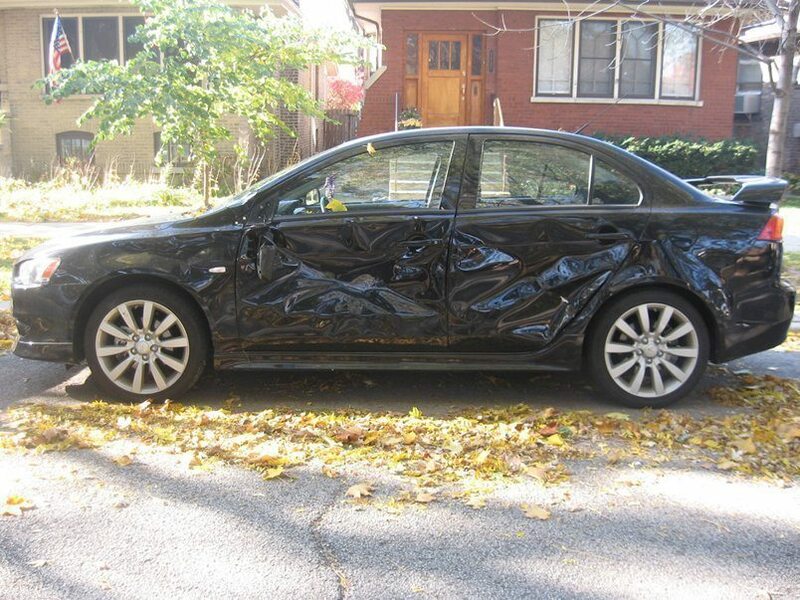 When a dent occurs in your car, the metal is actually stretched back and transformed. This means that, unlike popular belief, the metal cannot just be pushed out or “popped” back into place. Instead, the metal itself needs to be shifted back to what it originally was. Doesn’t really seem as easy as those tutorials led you to believe, right? What paintless dent repair does is slowly push the metal back into itself to shrink it back to size. We do this by essentially putting a series of smaller dents that will eventually look corrugated, but will have the metal back to its original size. Of course, we have to then make sure that the corrugated effect is gone by continuing to mold and mesh the metal back to its original size. When we have finished molding and fixing the dent, we inspect the spot in many different lights and angles so that we can ensure that the dent is truly gone. While we are usually satisfied with these first results, we will go back and fix any imperfections that we see. We want your car to get back to you as good as new – literally. Collision Center of Andover strives to meet every single one of your car repair needs after a collision or situation that leaves your car in a less than desirable shape. 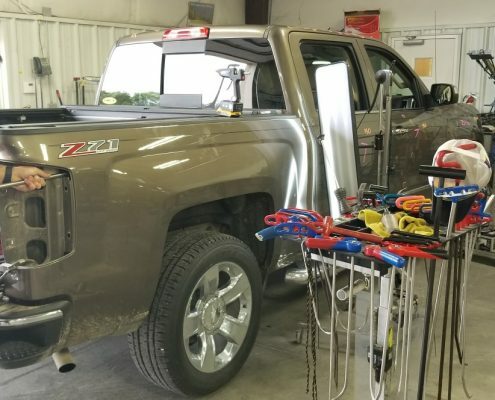 Our team has years and years of vehicle repair under our belts, and we are continually trying to learn the latest and most effective techniques to get you back behind the wheel as soon as possible. If you are interested in finding out more about our paintless dent removal service or any of the other services that we offer, contact us today and see just how we can help you!